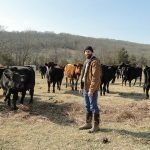 Brad Tucker of Mercy Lane Farm didn’t grow up on a farm, but has utilized resources to build and grow a registered Angus operation from the ground up. A focus on farm and family led Brad and his wife, Mandy, along with his sister-in-law and brother-in-law, Jeff and Shannon Britton, to find the right piece of land where both families could build homes. 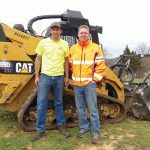 In 2012, they found the right piece of land in Rogersville, Mo., and were later able to purchase additional acreage for a total of 100 acres. Both families have four children and built neighboring homes so their kids could grow up together. However, Brad manages all of the cattle operations. Brad is self-taught and said building the operation has involved trial and error. He did not grow up on a farm, but spent time on best friend Jordan Hunter’s family farm. He said the Hunters have been an invaluable resource to helping him start and develop his program with their extensive knowledge on genetics, lineage, auctions and sales. Brad’s first cattle purchase was a small herd of Herefords, but he moved solely to Angus in 2015. 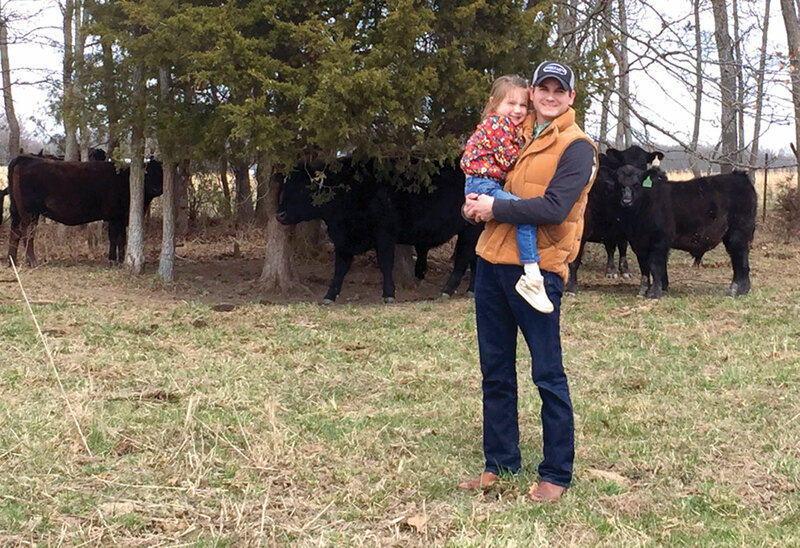 The Hunter family operates an Angus operation and it was a natural fit for Mercy Lane to start a foundation herd for the future. They currently have total herd of 30 that includes cows, calves, heifers and three bulls. Two bulls will be in the upcoming Four States Angus Sale. The goal is to purchase 10 recipient cows and have herd of 30 to 40 solid cows. Mercy Lane breeds solely by AI, as Brad feels that this is the best way to get the potential genetics he wants. He plans to begin an embryo transfer program later this year. A donor cow was purchased from the Hunters with plans to flush in December. 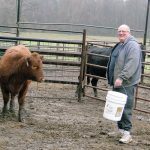 Mercy Lane has only calved in the fall since the cows that were purchased when the program began calved in the fall and Brad has continued with this program. Brad said they will probably move to calving in the spring and fall as they grow their herd and they implement the embryo transfer program. There are plans to purchase more commercial Angus for embryos to have more numbers for fall and spring calving. The cattle are currently on pasture, grass hay and some rye baleage. They purchase most of their hay. The bulls and young heifers receive grain purchased from Main Street feeds. Brad creep feeds calves because he feels it is a power pack for them to bring them to their potential sooner. Brad feels that a good, basic feeding program allows for the genetics to come through. They deworm and vaccinate twice a year, in the spring and fall. Like any business, they want to manage costs effectively as possible, but feel it is important to be proactive on preventative medicine, like vaccinations and deworming. When calves are born, the goal is to weigh and tag them as soon as possible. Brad has a focus on solid confirmation and building his cattle from the ground up. He says it’s important for them to have good feet and doesn’t want to breed for any extremes. He wants his cattle to look good, but feels it is important for them to stay balanced and functional. Now that the operation has been going for a while, he is starting to see the breeding program come full circle. He said it takes time to know if breeding decisions were right and the satisfaction of seeing cattle with the desired looks and confirmation. His philosophy for the program changes as he sees who are the stronger females and where he wants more out of a specific pairing. One of the goals for Mercy Lane Angus is to grow the cattle operation for their children’s future and for them to eventually show cattle, if they have an interest in it. Brad feels helping with the farm and showing will help to show their kids hard work, responsibility and showmanship. The main short-term goal is growing and developing a successful embryo transfer program and implanting 100 percent by embryo transfer. One long-term goal is to continue developing an online presence, and eventually host an online production sale at their property. One of the challenges Brad says he faces, is that since he didn’t grow up on a farm or in the industry, he doesn’t have the long-term relationships that some producers have. He feels that by growing Mercy Lane’s online presence, that it will help them overcome that and get knowledge of their program out in the market.